This synthesis paper discusses the research exploring analogical reasoning, the role of analogies in the engineering design process, and educational applications for analogical reasoning. Researchers have discovered that analogical reasoning is often a fundamental cognitive tool in design problem solving. Regarding the possible role of analogical reasoning in the context of technology education; analogies may be a useful tool to develop student’s design skills, teach abstract or complex concepts, and build students’ analogical reasoning skills for general problem solving. The positive and negative educational implications of analogical reasoning being explored by researchers are also discussed. With the development of the Standards for Technological Literacy: Content for the Study of Technology ( ITEA, 2000 ) and a focus on the integration of engineering design, the profession has attempted to standardize, validate a need for technology education, and most importantly increase students’ technological literacy. Technological literacy has been defined as the “ability to use, manage, assess, and understand technology” ( ITEA, 2000 , p. 9). The National Academy of Engineering and the National Research Council, in a joint report ( 2002 ), pointed to three interdependent dimensions of technological literacy: (a) knowledge, (b) ways of thinking and acting, and (c) capabilities. Engineering, with its emphasis on design, has been proposed to help bring about technological literacy and improve these cognitive skills (Dearing & Daugherty, 2004). The emphasis on cognition within technology education has led to an increased focus on cognitive science research, which has sought to understand how people think and learn. These efforts have been used to better develop instructional strategies for applications such as teaching creative, real world problem solving. In this pursuit, researchers have examined how knowledge is constructed, stored, and utilized. Schema theory, for example, has been posited as an explanation of how knowledge is represented and then applied. According to this theory, knowledge is constructed and stored as mental models or schemata. Schemata are the active representations of knowledge and general belief structures that support understanding, reasoning, and prediction. Experiences and knowledge inform the creation of schemata and new knowledge leads to the revision of previously formed schemata. Schema must then be activated from memory to be used or revised ( Ball, Ormerod, & Morely, 2004 ; Gentner, 2002 ). It is this active process that may be of particular interest to the field of technology education. Understanding how engineering designers store and retrieve knowledge during the design process can be particularly beneficial to informing technology education. The retrieval of prior knowledge to solve engineering design problems is an important part of the design process. As evidenced in the following excerpt from a verbal protocol study by Ball, Ormerod, and Morely (2004) , a subject recalled prior knowledge, stating, “I’ve designed outdoor terminals before, so, straight away, I’m thinking about how this relates to my knowledge of what I’ve done before…” (p. 7). This association between the current challenge (in this example: designing a rental car automated terminal) and past experiences (designing outdoor terminals) is fertile grounds for study. These links differentiate novice and expert designers and provide a tool for connecting previous experiences with new and unfamiliar challenges. The storage and retrieval of knowledge within the problem solving process is of particular importance to informing the integration of engineering design content and processes into technology education. Design problem solving is an integral component of engineering and by learning from experts, educational practices can be better developed to teach novice students design skills. This integration has been spurred by many researchers within technology education. For example, Lewis (2005) argued that design is “the single most important content area set forth in the standards, because it is a concept that situates the subject more completely within the domain of engineering” (p. 37). Engineering design, however, is not yet fully understood and educators disagree how and at what level design should be taught. Technology education researchers and practitioners are faced with the challenge of how to teach engineering design authentically. An avenue of exploring expert design cognition with the intent of informing technology education teaching practices is to understand how designers store and retrieve knowledge within the associative, similarity-based reasoning system. 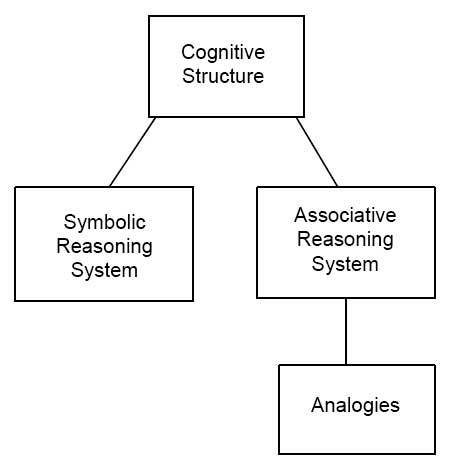 Two systems have been theorized to exist within a person’s cognitive structure: (a) the symbolic system, and (b) the associative reasoning system, as shown in Figure 1. Schemata can be viewed as being stored and utilized in both of these cognitive systems. The symbolic or rule-based reasoning system is where abstract real world problems are reasoned about and solved through symbolic representations and rules. The associative, similarity-based reasoning system is where problems are reasoned about through associations or similarities with other known information. Although researchers disagree as to which system is dominant, this second system is significant because associative reasoning is viewed to be a fundamental part of expert design cognition ( Akin, 2001 ; Goldschmidt, 2001 ). Figure 1. Graphic representation of the cognitive structure for reasoning through analogies. Analogical reasoning is a function of the associative, similarity-based reasoning system, as shown in Figure 1. This type of reasoning is a method of activating stored schema based on the identification of connections, parallels, or similarities between, what are typically perceived as dissimilar items. Analogies serve as a type of scaffolding, where new information is anchored to existing schemata. Analogical reasoning is thus the use of schema analogues, or knowledge from previous experiences, to facilitate learning in a new situation ( Ball, et al., 2004 ; Cross, 1994 ). Analogies enable an individual’s symbolic ability or “the ability to pick out patterns, to identify recurrences of these patterns despite variation in the elements that compose them, to form concepts that abstract and reify these patterns, and to express these concepts in language” ( Holyoak, Gentner, and Kokinov, 2001 , p. 2). Researchers have discovered that analogical reasoning is often a fundamental cognitive tool for design problem solving. Available resources already stored in the mind as schemata are recruited to fortify the search for problem-solving strategies through analogies ( Goldschmidt, 2001 ). Perhaps one of the most notable examples of design problem-solving through the use of analogies is the creation of Velcro®. According to the Velcro® Industries B.V.’s website, the inventor, George de Mestral’s walk in the woods led to the hook and loop fastener component of the design. Mestral noticed the “natural hook-like shape” of the cockleburs attached to his dog’s fur and his clothes. He recognized a parallel between the cockleburs attached to his fabric and the potential for a new design in mechanical fastening. To explore the potential of this new design, he analyzed a cocklebur under a microscope and then partnered with a fabric manufacturer to create a fabric system with characteristics similar to the cocklebur. He was able to envision the possibilities of creating a new design (Velcro) based on a naturally existing design (cocklebur) by drawing analogies between the two. Structure mapping is a theory explaining analogical reasoning. Structure mapping theory posits that schema analogues can be viewed as being similar according to their relational structures or how they relate. In other words, an analogy is the identification of particular aspects of one item (referred to as the known or base domain), as being similar to certain aspects of another item (the unknown or target domain), as shown in Figure 2. The base domain and target domain are not similar on all accounts, but through structure mapping the relational structure of the base and target domains are found to be similar ( Gentner & Gentner, 1983 ). Structure mappings allow for the construction of new schema based on inferences and predictions. The inferences undergo a transformation bringing the two items close enough together to allow mapping and transfer from the base to the target ( Goldschmidt, 2001 ). Causality can then be inferred and causal mental models or schemata developed. Figure 2. Graphic representation of the structure mapping process that explains analogical reasoning. Similar to structure mapping, Holyoak and Thagard (1997) outlined the steps involved in learning through analogical reasoning, including; (a) the retrieval step, (b) the mapping step, (c) the inference step, and (d) the learning step. Moving from the target analog (base domain) to the source analog (target domain), analogies are accessed in the retrieval step when the learner is trying to reason about a new situation. During the mapping step, similarities or correspondences between the source and target are found. Inferences about the two domains are made during the inference step and then “a kind of abstraction of the commonalities shared by the source and target” (p. 35) is developed during the learning step. Holyoak and Thagard further outlined a “multiconstraint theory” of analogical reasoning that explains how analogies are guided by three particular kinds of constraints: (a) similarity, (b) structure, and (c) purpose. The use of analogy is often guided by a similarity of concepts between the base and target domain. In addition, consistent structural parallels often exist between the roles in the base and target domains. Finally, analogical reasoning is typically guided by a purpose or a goal that the analogy is intended to achieve. According to Holyoak and Thagard, these constraints “function more like the various pressures that guide an architect engaged in creative design, with some forces in convergence, others in opposition, and their constant interplay pressing toward some satisfying compromise that is internally coherent” (p. 36). Researchers have concluded that analogical reasoning can be categorized into two different forms. First, analogical reasoning can be used to understand the operation of a new device. Schema, or stored knowledge, of how a device operates is used to reason about how an analogous device might operate or understanding how to operate a device can be inferred from knowing how the larger system works ( Kieras & Bovair, 1984 ). Second, analogical reasoning uses schema, or knowledge already stored, to reason about, infer, and/or predict information to solve a problem. In other words, analogue schemata are used to compare what is already stored as schemata, to a new domain of knowledge (Schumacher & Czerwinski, 1992). These two basic forms of analogical reasoning (understanding the operation of a device and problem solving) are also commonly found in the technology education classroom, although they may not be made explicit to the students. For example, in teaching a lesson on automation, teachers may include an activity during which students learn to program a robotic arm. A typical robotic arm is anthropomorphic in structure, meaning that it is analogous to the human arm. Students easily relate their shoulder, elbow, wrist and fingers to the robot’s arm and end effectors. This analogy aids the students in learning to program a pick and place operation using a new technology that might otherwise seem foreign and unfamiliar to them. The ability to use analogical reasoning about how the device will perform like a human’s arm enables the students to develop schema about robotics. In problem solving applications, students may be less aware of the use of analogical reasoning but can be made aware through instruction. The development of analogical reasoning can be an important tool in the development of students’ engineering design knowledge. For example, in presenting students with the challenge of designing a tower for a shake table earthquake simulation, teachers can prompt students to draw on their knowledge of geometric shapes. Many students have learned that triangulation leads to structural stability. During the design and building of this activity, students who consider the analogy between their understanding of triangulation and stability in the design of their tower may be able to reason through their design more easily. An optimization process emerges as students balance the need to conserve building materials in order to meet the goal of a tall structure, with the need for stability during the shake. An important distinction should be made between metaphors, literal similarities, and types of analogies. According to Gentner and Jeziorski (1993) , metaphor can be viewed as a broad category encompassing analogies. However, Miller (1993) argued that in a broad way, “any expression of similarity or resemblance can be called an analogy” (p. 378). A way to distinguish between the two is to categorize metaphors as items compared from the same category and analogies as items compared from different categories ( Saha, 1988 ). The “grounds for a metaphor, therefore, can be formulated as relations of similitude that can be expressed as comparison statements” ( Miller, 1993 , p. 398). An analogy is perhaps a more creative comparison of less similar relations. An “analogy is a way of aligning and focusing on relational commonalities independently of the objects in which those relations are embedded” ( Gentner & Jeziorski, 1993 , p. 449). Gentner and Gentner (1983) clarified the distinction between literal similarities and analogies by referring to how the items are structured as schema. Items are literally similar when the particular characteristics of the items are the same. Items are analogous when the relational structures are similar, but the particular characteristics of each item are not the same. 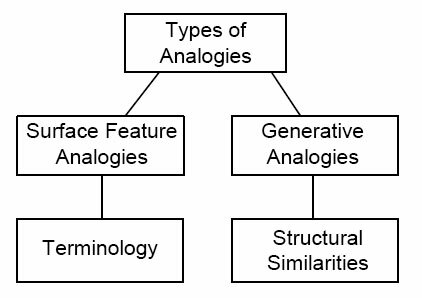 Two different types of analogies can be distinguished as shown in Figure 3, surface feature analogies and generative analogies. Goldschmidt (2001) pointed out that analogies can have either structural or surface feature commonalities that are carried over to new items or situations. Items that are analogous based on their surface features, however, may not be analogous structurally or conceptually. For example, language or analogical terms can be borrowed from one domain as a convenient way of talking about another domain. Figure 3. Types of analogies. known about the base domain. Not only inferences, but also predictions can be made based on analogies. In other words, analogies allow a person to go beyond the familiar and reason about the unfamiliar ( Collins & Gentner, 1987 ). Goldschmidt (2001) pointed out that inferences and predictions with generative analogies can be made because they are often not just identified but visualized. Individuals are able to imagine or “run” actions in their minds, such as causality, based on what is known about the base domain. Literal similarities, metaphors, and surface feature and generative analogies may all be identified in the classroom. For example, commonly found in technology education classroom are various tools such as multimeters or handheld GPS units. School districts often purchase these tools over a span of a few years and thus classrooms may have multiple units of different models or brands. A teacher will typically provide a demonstration on one unit and expect the students to be able to see literal similarities and realize that each unit will have the same features while the physical appearance may vary drastically. Metaphors are often used during instruction. Metaphors can serve as “linguistic tools for overcoming certain cognitive limitations” ( Sticht, 1993 , p. 622) by extending students’ active memory through language. A great example of using metaphors in technology education is in the teaching of machining patterns during a lesson on CNC milling. Students are typically more familiar with the use of a lawn mower than they care to be and this provides for a solid knowledge base from which to understand machining patterns. A facing, pocketing, or contouring operation can be compared to cutting grass with the lawn mower. Such concepts as depth of cut, finish passes, and method of cut such as: zig-zag, one way, and spiral lend themselves to comparison with lawn mowing activities. Students clearly understand that tall grass will required multiple depth cuts and/or slower traveling speeds, just as a rotating tool would break if presented with an excessive depth of cut and/or traverse speed. Surface feature analogies rely primarily on terminology. During a lesson on laser technology, the light from a laser is analogous to a beam and hits a point on the wall or target. While a laser beam and a beam used in the construction industry are two very different concepts, they share some common surface features: they are both straight, with a relatively small cross-sectional area. While the laser beam illuminates what is described as a point, the target has a cross-sectional area that may be more appropriately termed a small circle (assuming the aperture is circular). A point is a theoretical concept, but in this case, it creates an analogy differentiating the laser beam from typical incandescent or florescent lighting that floods the room. The student compared the flowing electricity to their knowledge of automobile traffic on a highway. Their ability to visualize and “run” a simulation of manipulating a variable in this system and predicting its effects on the system’s behavior is demonstrated. If cars slow for a restriction, then current must slow when resistance is encountered. As discussed, literal similarities, metaphors, and analogies are often used tools in the teaching of technology and can be furthered enhanced to better prepare students’ problem solving skills. In their engineering text, Dym and Little (2004) promoted the use of similarities, metaphors, and analogies to encourage creative, divergent thinking in students. In particular they argued that analogies have the potential to be “very powerful tools in engineering design” (p. 103). For example, they compared the designs of scaffolding and angioplasty to indicate the ability of designers to stretch their knowledge to be able to solve complex design problems. An angioplasty stent’s intent and function is similar to scaffolding erected to support walls in mines as they are being built. A stent supports the walls of the artery as surgeons operate. This example makes clear to students that inspiration can be found in other designs whether they are directly similar or only similar in terms of form or function. Expert analogical reasoning has been studied to understand how to better develop this cognitive tool in novices. Dreyfus and Dreyfus (1986) stated that the ability to analogically reason is an important component in the development of expertise. They outlined five stages in the progression from novice to expert. This progression is characterized by performance based on the analytic, detached behavior of the novice, to the involved, experience-based behavior of an expert. One of the components Dreyfus and Dreyfus saw as a distinguishing mark of proficiency in performance was the ability to recognize new situations as similar to remembered situations (i.e., the ability to use analogies). Other researchers have differentiated between the type of analogical reasoning used by experts and novices. Ball, et al. (2004) , for example, concluded that expert engineering designers use more schema-driven analogizing while novice engineering designers use more case-driven analogizing. Schema-driven analogizing is the application of abstract knowledge to familiar problem types, affording a design solution seemingly effortlessly. Ball, et al. concluded that experts develop numerous design problem schemata because they are exposed to and learn from many domain-specific problems. Experts develop a conceptual understanding of the underlying nature of domain-specific problems, which then enables them to recognize problem types. Experts not only engage in schema-driven analogizing, but also spontaneous analogizing. When an expert encounters a problem, an appropriate schema that is analogous to the problem type is automatically accessed. This schema usually indicates a straight-forward solution method based upon previous application of the solution to the analogous problem. Novices, however, have not had the opportunity to develop a repertoire of analogous problem type schemata. They rely heavily on case-driven analogizing when solving design problems. Novices apply specific solution elements from prior design problems to current problems. Novices do not recognize problem types as do experts; instead they analogize according to the specific components of the problem-solution schema. Interestingly, Ball, et al. found that experts and novices alike use this method when experts encounter non-routine engineering design problems. When experts face a problem that cannot be spontaneously mapped to an analogous problem type and cue appropriate solution methods, they focus on developing surface level analogies between the target problem and similarly encountered cases. Case-based reasoning (CBR) is a methodology that was originally developed in the realm of computer cognition, but as Kolodner (1997) discussed, it has been extended to explore human cognition as well. CBR has two central components; (a) the use of analogies to solve real-word problems, and (b) the use of computational modeling to derive hypothesis about cognition. Analogies in CBR typically reflect personally experienced situations called cases and include “a sought-after goal, a method for achieving the goal or solution to the problem and the results (outcome) of carrying out that method (solution), all of this described specifically” (p. 59). The intention is to provide cases so as to enable the development and use of analogical inferences to help solve real-world problems. The representation of the problem has been found to be an important component in analogical reasoning in design problems. Akin (2001) , for example, found that analogical reasoning is based on how directly the given problem corresponds to the problem solver’s schemata. If the problem is ill-defined, the problem solver must continually re-structure the problem in order to search for an appropriate solution. These frequent shifts of problem representation can affect the use of analogical reasoning. Because experts seem to rely on problem types to invoke analogous problem schemata, an ill-defined problem, which does not fit into a recognized problem type, requires frequent restructuring or the use of other search strategies besides analogical reasoning in order to develop an adequate solution. Another important component of analogical reasoning in design problems is creativity. As Perkins (1997) articulated, analogy is “the creature that carries people’s cognitive capacities across the desert of unworkable possibilities from the familiar to true innovations” (p. 524). Specifically, analogies can play an important role in conceptual change, which is a crucial aspect of creativity. Four analogical processes can be used to spur conceptual change: (a) highlighting, (b) projection of candidate inferences, (c) re-representation, and (d) restructuring ( Gentner, et al., 1997 ). Analogies focus attention on specific aspects of the base and target domains, highlighting relevant information. By projecting inferences, analogies aid in the development of knowledge within the target domain. Rerepresenting either or both the base or target domain to improve the analogy can further establish conceptual change. Finally, analogies can spur the restructuring of elements of the target domain to form a new explanation. Researchers have examined the issues involved with the use of analogies in instructional practices within design. Although analogical terminology is already an often used instructional technique, as Gentner and Jeziorski (1993) pointed out, analogical reasoning is rarely formally taught to students. Typically, language is borrowed from one domain to talk about another usually more complex domain. Instructors seem to believe that students can learn concepts and operations in a new domain by connecting to similarities from a previously learned domain. Instructors teaching electricity, for example, often rely on analogies such as comparing similar features of water to electricity ( Gentner & Gentner, 1983 ). However, as pointed out earlier, surface commonalities do not necessarily mean that the base and target domains are analogous structurally. Superficially similar problems may not have underlying similarities to where appropriate solutions can be inferred ( Ball, et al., 2004 ; Goldschmidt, 2001 ). Kempton (1986) , for example, found that many individuals’ analogies for thermostats were not structurally similar to how thermostats actually operate. Many analogized that their thermostat system operated like a valve. Although the valve analogy provided for correct functionality of the thermostat, the complete understanding of how thermostats operate would have required a total replacement of the analogue schema. Thus the reliance on analogical reasoning can be problematic for instructors. For example, schemata developed from experience can be resistant to change through instruction ( Gentner, 2002 ). Even when presented with conflicting information, individuals are likely to hold onto their existing schema. This persistence has been referred to as a cultural boundary. Isolated elements or terms may be incorporated into the existing schema, but the underlying schema will remain unchanged ( Kempton, 1986 ). Halasz and Moran (1982) warned against using analogies to teach new learners computer systems because of these problems. They argued that analogies may actually hinder, not help, the development of a good understanding of the target domain because “analogical reasoning requires considerable work to sort out the relevant mappings and allowable inferences” (p. 385). Instead, they recommend using conceptual models, which can be shaped without the “baggage” of analogies. Conceptual models represent the underlying conceptual structures within a specific context, providing a sound basis for reasoning about the system. Although analogies provide a link to a learner’s prior knowledge, conceptual models increase the learner’s reasoning abilities because complexities of a system are reflected more so in a conceptual model than in an analogical model. Other researchers, however, have argued that analogical reasoning can be a powerful instructional strategy because students already rely on analogical thinking to comprehend the world and solve problems. Goldschmidt (2001) , for example, declared that people can be trained to maximize the processing resources with which they are endowed. As Holyoak and Thagard (1997) pointed out, young children “before they enter school, without any specialized tutoring from their parents or elders, develop a capacity for analogical thinking” (p. 35). Based on this belief, students can then be taught to improve their analogical reasoning skills. Instructors may also utilize analogies to better teach abstract information. Analogies can be used to increase far learning transfer by bridging knowledge from familiar domains to abstract, unfamiliar domains. Bridging analogies is a type of scaffolding where new information is anchored to existing schema. By progressing in small steps, using analogies along the way, the learner gradually moves to another way of conceptualizing the concept or domain, and ultimately forms a new schema or revises an existing schema ( Gentner, 2002 ). What are the general aspects of the starting conditions and the goals? What are the relationships among the objects in the starting conditions and the goals? What past problems does this problem look similar to? Direct analogies : are found by seeking a biological solution to a similar problem. For example, plant burs were used as analogy to design Velcro fastening. Personal analogies : are used by designers when they imagine what it would be like to use themselves as the system or component that is being designed. For example, designers might ask questions like how would I operate if I were a washing machine? Symbolic analogies : are poetic metaphors and similes that are used to relate aspects of one thing with aspects of another. For example, words like “head” and “claw” can be used to describe aspects of a hammer. Fantasy analogies : are impossible wishes for things to be achieved in some magical way. Designers envision the ultimate goal, for example, making bumps in the road disappear beneath a car’s wheels ( Cross, 1994 ). Analogies may be a useful tool to not only develop design skills, but teach abstract or complex concepts and build analogical reasoning skills, within a technology education setting. Opportunities to model and use analogical reasoning are abundant within technology education. A broader approach to using analogical reasoning in a technology education setting would be to first establish the base domain. For example, by first building a schema around a systems approach (input → process → output; and feedback), analogies can be used to understand a multitude of technical processes. The systems approach focuses on the structure of the system or how the components are connected to each other, the function of the components within the system, and the behavior of those components. By understanding the systems approach, students can better understand the causal interactions that occur between components or devices. An excellent example in technology education is the explanation of inter-modal transportation. There are many components to inter-modal transportation; however, with an understanding of systems thinking, students can more easily map the inputs (cargo), the processes (containerization), and the outputs (shipping, globalization, economic growth, etc.). The use of analogies as proposed is subject to empirical evidence to support their effectiveness. Perhaps the most essential component to validate the use of analogies as an instructional strategy is to first understand how to assess student’s base domain knowledge. Effective analogical reasoning requires that the base domain knowledge is correct. As pointed out by Lewis (1999) , there is a need in technology education to examine questions pertaining to student’s conceptions and misconceptions of technological phenomenon in order to better inform teaching practices and improve learning. Lewis proposed parallel studies to those done in science examining student conceptions of such things as energy and thermodynamics, be completed in technology education. Other research needs to be completed to examine the role of analogical reasoning in design and its implications for technology education. For example, studies that examine synectics in the classroom need to be completed. Synectics has been formalized as an expert design method, but how will novice students engage in this type of approach to design? More research also needs to be done to explore the effectiveness of using analogical reasoning in design. Is this an approach that should be taught to novices or one that develops naturally through experience? More thorough understanding needs to be uncovered about the “baggage” described by Halasz and Moran (1982) . Should analogizing not only be avoided, but actually be dissuaded as an approach to problem solving and design? Analogical reasoning is just one of many important elements in design cognition that, with more empirical research, can inform and improve technology education practices. Akin, O. (2001). Variants in design cognition. In C. Eastman, M. McCraken, & W. Newstetter (Eds. ), Knowing and learning to design: Cognition in design education. (pp. 105-124). Amsterdam: Elsevier Science Press. Ball, L. J., Ormerod, T. C., & Morely, N. J. (2004). Spontaneous analogising in engineering design: A comparative analysis of experts and novices. Design Studies, 25 , 495-508. Casakin, H., & Goldschmidt G. (1999). Expertise and the use of visual analogy: Implications for design education. Design Studies, 20 , 153-175. Collins, A., & Gentner D. (1987). How people construct mental models. In D. Holland & N. Quinn (Eds. ), Cultural models in though and language (pp. 243-265). Cambridge: Cambridge University Press. Cross, N. (1994). Engineering design methods: Strategies for product design. (2 nd ed.) Chichester, England: John Wiley & Sons. Dreyfus, H. L., & Dreyfus, S. E. (1986). Mind over machine: The power of human intuition and expertise in the era of the computer. New York: The Free Press. Dym, C. L., & Little, P. (2004). Engineering design: A project based approach (Second ed.). Hoboken: John Wiley & Sons. Gentner, D. (1981, August). Generative analogies as mental models. Proceedings of the third annual conference of the cognitive science society. Berkley, California. Gentner, D. (2002). Mental models, Psychology of. In N. J. Smelser & P. B. Bates (Eds. ), International Encyclopedia of the Social and Behavior Sciences (pp. 9683-9687). Amsterdam: Elsevier Science. Gentner, D., Brem, S., Ferguson, R., Wolff, P., Markman, A.B., Forbus, K. (1997). Analogy and creativity in the works of Johannes Kepler. In T. B. Ward, S. M. Smith, & J. Vaid (Eds. ), Creative thought: An investigation of conceptual structures and processes. (pp. 403-460). Washington, D.C.: American Psychological Association. Gentner, D., & Gentner, D. R. (1983). Flowing waters or teeming crowds: Mental models of electricity. In D. Gentner & A. L. Stevens (Eds. ), Mental models (pp. 99-129). Hissdale, NJ: Erlbaum. Gentner, D., & Jeziorski, M. (1993). The shift from metaphor to analogy in western science. In A. Ortony (Ed. ), Metaphor and thought (2 nd ed., pp. 447-480). Cambridge, MA: Cambridge University Press. Goldschmidt, G. (2001). Visual analogy: A strategy for design reasoning and learning. In C. Eastman, M. McCracken, & W. Newstetter (Eds. ), Design knowing and learning: Cognition in design education (pp. 199-218). Amsterdam: Elsevier Science. Halasz, F., & Moran, T. P. (1982). Analogy considered harmful. Proceedings of the Conference on Human Factors in Computer Systems (pp. 383-386). New York: ACM. Holyoak, K.J., Gentner, D., & Kokinov, B. N. (2001). Introduction: The place of analogy in cognition. In D. Gentner, K. J. Holyoak, & B. N. Kokinov (Eds. ), The analogical mind: Perspectives from cognitive science (pp. 1-19). Cambridge, MA: The MIT Press. Holyoak, K.J., & Thagard, P. (1997). The analogical mind. American Psychologist, 52 (1), 35-44.
International Technology Education Association. (2000). Standards for Technological Literacy: Content for the Study of Technology . Reston, VA.
Kempton, W. (1986). Two theories of home heat control. Cognitive Science, 10 , 75-90. Kieras, D. E., & Bovair, S. (1984). The role of a mental model in learning to operate a device. Cognitive Science, 8 , 255-273. Kolodner, J. (1997). Educational implications of analogy: A view from casebased reasoning. American Psychologist, 52 (1), 57-66. Lewis, T. (1999). Research in technology education. Journal of Technology Education, 10 (2), 41-56. Lewis, T. (2005). Coming to terms with engineering design as content. Journal of Technology Education, 16 (2), 37-54. Miller, G. A. (1993). Images and models, similes and metaphors. In. A. Ortony (Ed. ), Metaphor and thought (2 nd ed., pp. 357-400). Cambridge, MA: Cambridge University Press. National Academy of Engineering & National Research Council. (2002). Technically speaking: Why all Americans need to know more about technology. Washington: National Academy Press. Oxman, R. (1990). Prior knowledge in design: A dynamic knowledge-based model of design and creativity. Design Studies, 11 , 17-28. Perkins, D. N. (1997). Creativity’s camel: The role of analogy in invention. In T. B. Ward, S. M. Smith, & J. Vaid (Eds. ), Creative thought: An investigation of conceptual structures and processes. (pp. 523-538). Washington, D.C.: American Psychological Association. Saha, P. K. (1988). Metaphorical style as message. In D. H. Helman (Ed. ), Analogical reasoning: Perspectives of artificial intelligence, cognitive science, and philosophy (pp. 41-61). Boston: Kluwer. Sticht, T. G. (1993). Educational uses of metaphor. In. A. Ortony (Ed. ), Metaphor and thought (2 nd ed., pp. 621-632). Cambridge, MA: Cambridge University Press. Thagard, P. (1988). Dimensions of analogy. In D. H. Helman (Ed. ), Analogical reasoning: Perspectives of artificial intelligence, cognitive science, and philosophy (pp. 105-124) Boston: Kluwer. Note : The url provided above returned invalid results. Visser, W. (1996). Two functions of analogical reasoning in design: A cognitive-psychology approach. Design Studies, 17 , 417-434. Jenny Daugherty ( jdaughe2@illlinois.edu ) and Nathan Mentzer ( nmentzer@comcast.net ) are Doctoral Fellows affiliated with the National Center for Engineering and Technology Education ( www.ncete.org ) at the University of Illinois , Champaign-Urbana and Utah State University , respectively.